After your breakfast our safari guide will be ready to take you around for a city tour; or you may choose to enjoy a boat cruise to Ngamba chimps Island. Spend a day viewing orphaned chimps as they feed and exercise their acrobatics. In the evening transfer back to your lodge. 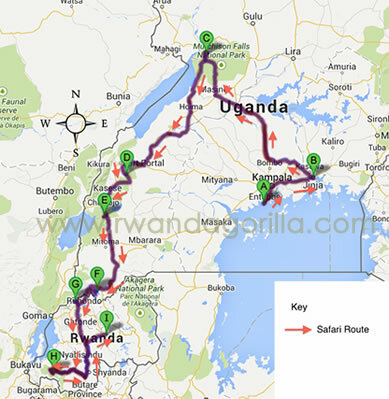 After breakfast, embark on a scenic trip to Fort Portal, a beautiful town overlooking the mountains of the moon. Taking the Western scenic route to Kibale National Park, the 6 – 8 hours drive will lead you through the Albertine Rift with stunning views of the escarpments overlooking Lake Albert. Dinner and overnight at Crater Safari Lodge(luxury),Primates lodge(mid-range), Chimpanzee Forest Camp(budget). Day 7: Chimpanzee tracking and a transfer to Queen Elizabeth national park. After an early morning breakfast transfer to the park headquarters for a pre-tracking briefing by the forest guide. Your tour guide will then transfer you to the starting point of the chimp trek. Expect primates including chimpanzees, red colobus, black and white colobus and the red-tailed monkeys among others. After lunch, transfer to Queen Elizabeth national park. It is 2 to 3 hours drive. Dinner and Overnight stay at Mweya Safari Lodge(luxury) / Enganzi Lodge(budget) / Park View Lodge(Mid-range)Day 8: Game drives and Boat cruise. After a cup of coffee, go for an early morning game drive along Kasenyi tracks and Queens mile in the park. Expect to see lions, elephants, cape buffalos, warthogs, spotted hyenas, mongoose, waterbucks, Kobs and many more. Drive back to the lodge for late breakfast and lunch. In the afternoon, after lunch, transfer to the Kazinga Channel for a launch cruise. Expect a variety of wildlife along the banks of the water channel between lakes Edward and George including buffalos, elephants, school of hippos, crocodiles as well as a variety of bird species. Dinner and Overnight stay Mweya Safari Lodge(luxury) / Enganzi Lodge(budget) / Park View Lodge(Mid-range)Day 9: Transfer to Lake Bunyonyi. Day 10: Transfer to Rwanda. Day 11: Gorilla Tracking adventure and nature walk. 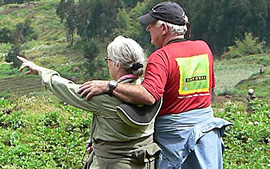 In the morning, you may either go for golden monkey tracking in the Volcanoes national park, where you will encounter other primate species or hike up to Dian Fossey grave. On return, after lunch, transfer to Lake Kivu and relax at the beach in the afternoon. Dinner and overnight stay Lake Kivu Serena (luxury)/ Paradise Malahide (mid-range)/Water Front Resort(budget). Day 13: Transfer to Nyungwe Forest National park. After a relaxed breakfast, transfer to Nyungwe Forest National Park through scenic valleys and terraced hills. Dinner and overnight atNyungwe Forest Lodge (luxury)/Nyungwe Top View Lodge(deluxe)/Gisakura Guest House (budget). Day 14: Colobus monkeys Tracking – canopy walk – nature walk. Take your breakfast before 6.00 am and embark on Colobus monkeys Tracking in Nyungwe Forest. Expect to encounter the Angola colobus monkeys, forest birds, and butterflies. There are 13 primate species in the forest. In the afternoon if still strong, you may go for nature walk to the tea factor. Dinner and overnight stay. Nyungwe Forest Lodge (luxury)/Nyungwe Top View Lodge(deluxe)/Gisakura Guest House (budget). Day 15: Transfer to Kigali. In the morning after breakfast, transfer to Kigali with en route visit to the King’s Palace at Nyanza, Butare Museums and Murambi Genocide Memorial Site reaching Kigali in the evening and transfer to the airport for your departure flight if on schedule.